Is the era of easy money over? 1. Darkening credit outlook: The Federal Reserve spiked the punch bowl a decade ago. Now the party may be over. Record-low interest rates ushered in a period of easy money that nursed the economy back to health. But the recovery from the Great Recession is nine years old. 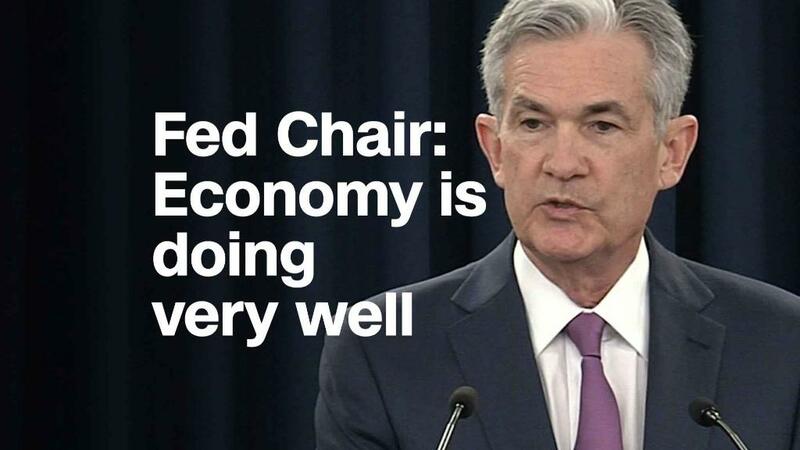 With unemployment low and inflation heating up, the Fed is gradually raising rates. Lending conditions are still lenient, but that may soon change. Credit conditions are forecast to deteriorate over the coming months, with defaults and borrowing costs rising, according to a survey released last week by the International Association of Credit Portfolio Managers. "People are getting ready for the downturn," said Som-lok Leung, the assocation's executive director. "It doesn't mean it's going to come immediately. But cycles still exist, and eventually it will turn." When it's very easy to borrow money, interest rates on loans are closer to the rates on risk-free US Treasuries. That gap, known as the credit spread, widens when nervous investors are less willing to take on risk. In the IACPM survey, the percentage of investors expecting credit spreads to widen over the next three months was the highest since the second quarter of 2008 — just before the worst of the financial crisis. No, investors aren't predicting a return of those scary times. But the results do signal a view that borrowing costs have nowhere to go but up. "It's hard for things to get better," Leung said. "Interest rates are rising and there are trade disputes." Much to President Donald Trump's dismay, the Fed has bumped rates up twice this year. And the central bank has signaled it will raise rates twice more before year's end. Major companies, even ones with lots of debt, have still been able to borrow money. That's fueled a boom in mergers and leveraged takeovers. Consider the $85 billion of debt that Comcast (CMCSA) lined up for its failed bid to acquire 21st Century Fox (FOXA). Borrowing conditions have been helped by the corporate tax cut, which gave Corporate America more cash to pay down debt. But investors are no longer as willing to lend money for long periods of time. The average duration of a newly issued corporate bond has slipped below five years, compared with nearly seven years in 2017, according to BlackRock. People are worried that a recession could be coming, said Karen Schenone, a fixed income product strategist at BlackRock's iShares ETF platform. "They want to be nimble if the situation changes," she said. 2. Will GDP top 4%? Economists think the economy heated up in the second quarter. We'll get our first reading on Friday, when the Commerce Department reports on economic growth. Economists surveyed by Thomson Reuters expect 4.1% growth. That would be a big pickup from the 2% growth of the first quarter. Economists think the combination of tax cuts and a tight labor market should help. The economy has been growing for nine years, the second-longest boom on record. Trump's top economic adviser, Larry Kudlow, said last week that it could keep going until 2024. That's much further than mainstream economists are willing to go. 3. Trump's trade meeting: Trump, who is fighting trade battles on many fronts, is set to meet Wednesday with European Commission President Jean-Claude Juncker. The two leaders "will focus on improving transatlantic trade and forging a stronger economic partnership," the White House said. But the Trump administration has shown no signs of backing off. The administration is preparing another round of tariffs on Chinese goods worth $200 billion. The United States has already put tariffs on aluminum and steel imports from the European Union, and now Trump is threatening to hike tariffs on cars and auto parts from the European Union to 20%. 4. Harley-Davidson earnings: The motorcycle maker recently got caught in the crosshairs of Trump's trade policy. Executives will have the chance to talk about it when the company reports earnings on Tuesday. Harley-Davidson said last month that it is shifting some production of motorcycles for European customers out of the United States to avoid EU retaliatory tariffs. The company said it stood to lose as much as $100 million a year. The move caught Trump's eye. In a tweet, the president said he was surprised "that Harley-Davidson, of all companies, would be the first to wave the White Flag." 5. Disney seals the deal: Disney's acquisition of most of 21st Century Fox is about to become official. 21st Century Fox shareholders are scheduled to meet on Friday and are expected to approve the deal. Comcast was bidding for the same assets but dropped out last week. During the bidding war, 21st Century Fox's value surged 36%. With Fox, Disney may have the most formidable content portfolio in all of Hollywood, adding to an already impressive stable that includes Marvel, Pixar and LucasFilm.